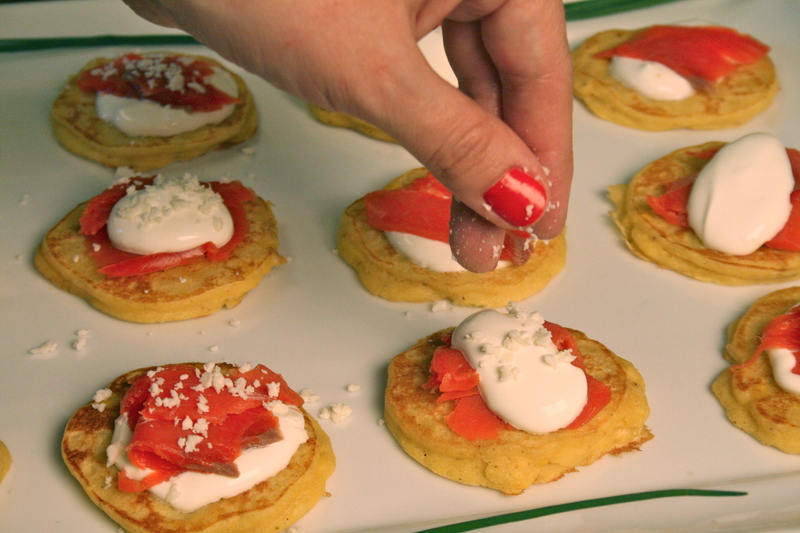 Corn Blinis topped with Smoked Salmon, Sour Cream, Cotija Cheese and Chives. Perfect snack for the Super Bowl. Super Bowl is less then two weeks away…. Let the party planning begin! Is Tom Brady your man? Or are you Eli Manning all the way? To be honest with you, I’m not a big football fan, but I LOVE Super Bowl. Guess why? You got it….. Yummy snacks all day long. Okay, the noshing isn’t the only part I enjoy, I take pleasure in watching the commercials and the halftime show too. My family is no different then all the rest of the feverish fans celebrating the big GAME! I’m sure my Tia is in a frenzy right now coming up with a perfect menu to cheer her team on with. She asked me to bring an appetizer to her party for Super Bowl Sunday and said she wanted something slightly on the fancy side but easy to make. I called on the help of my beloved Maseca and came up with a little nibble for people to snack on come game time. May the best team win and I hope the commercials are good too! 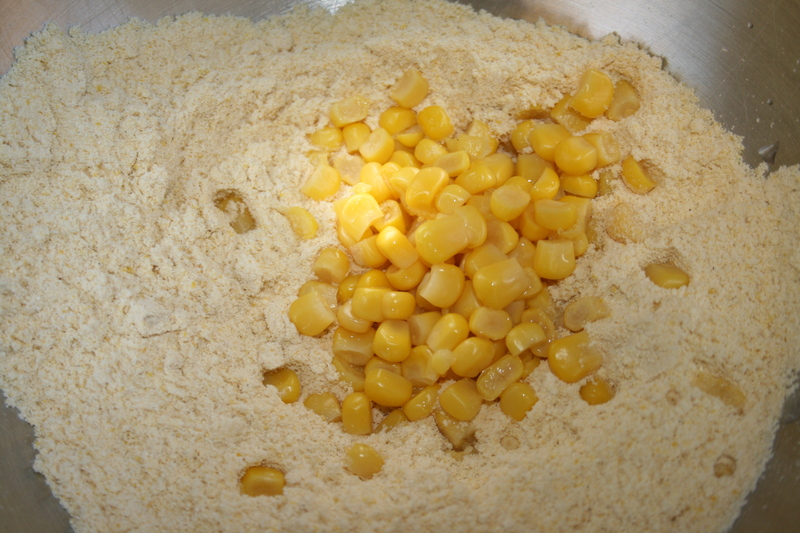 Add Maseca corn flour and cornmeal to bowl of a stand-up mixer. 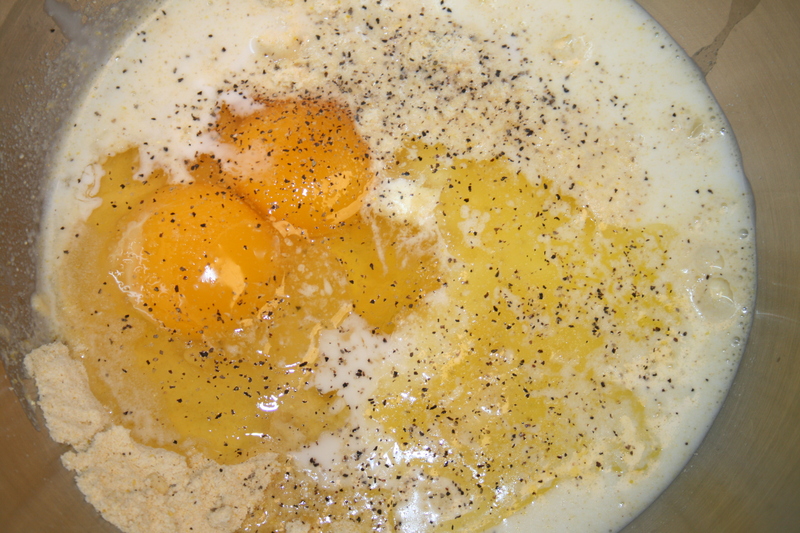 Then add in corn, eggs, butter, milk, salt and pepper. 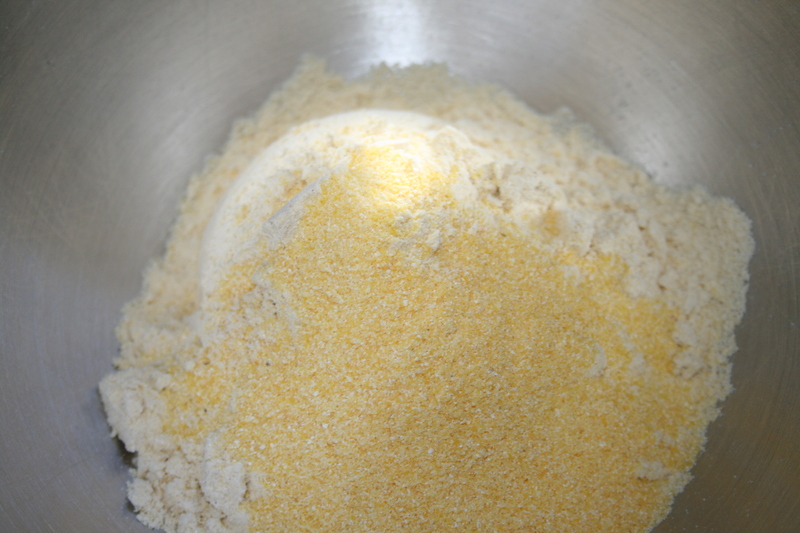 Mix to combine all ingredients. 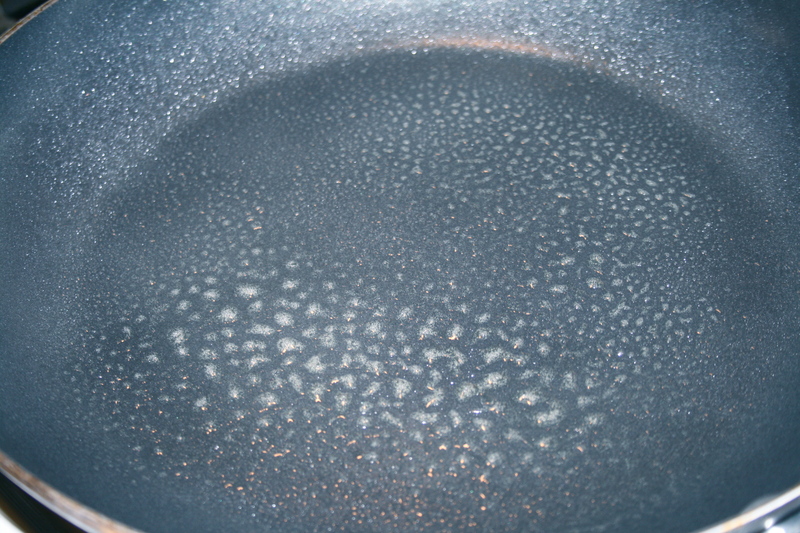 Spray a large frying pan with a non-stick cooking spray and allow to get hot. 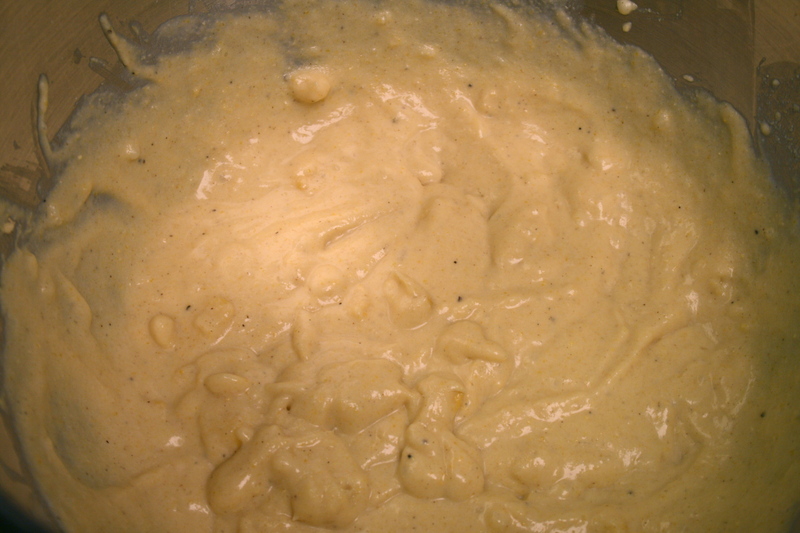 Then take a tablespoon of batter and pour into pan. 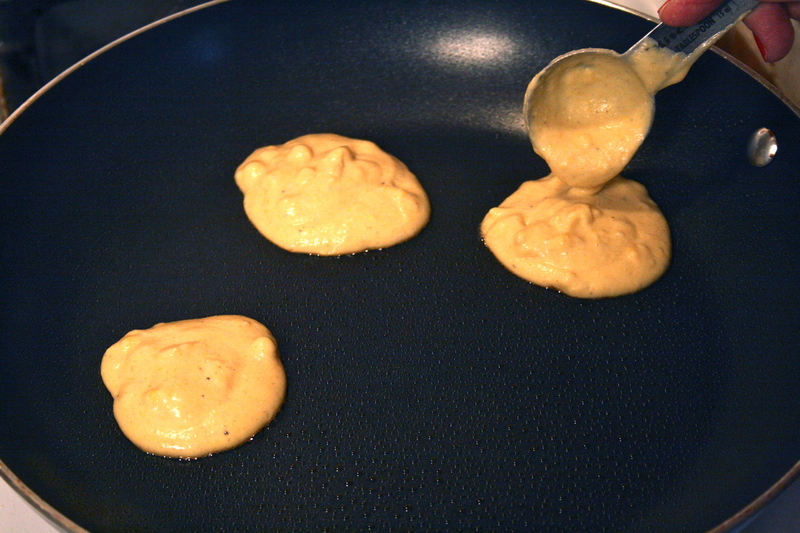 Batter will spread. Cook for 1 1/2 to 2 minutes on each side. 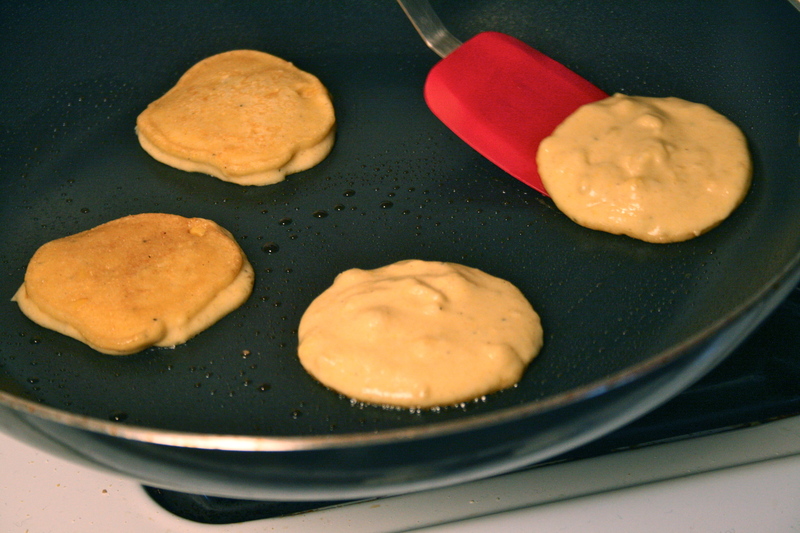 Repeat until all corn blinis are made. 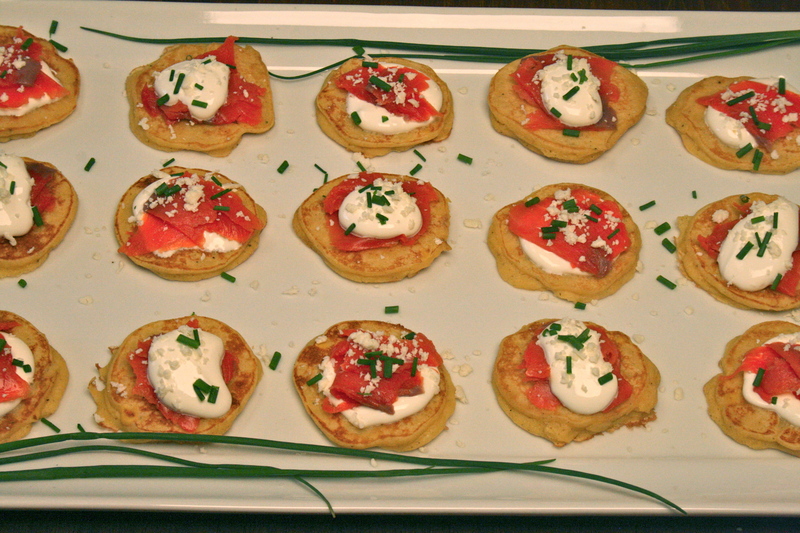 Place on a platter and top with sour cream, smoked salmon, a pinch of grated cotija cheese, and a dash of chives. A super yummy appetizer for game day….. Easy to make! Disclosure: This is a sponsored campaign for Maseca and Latina Bloggers Connect. All opinions and recipe are my own. 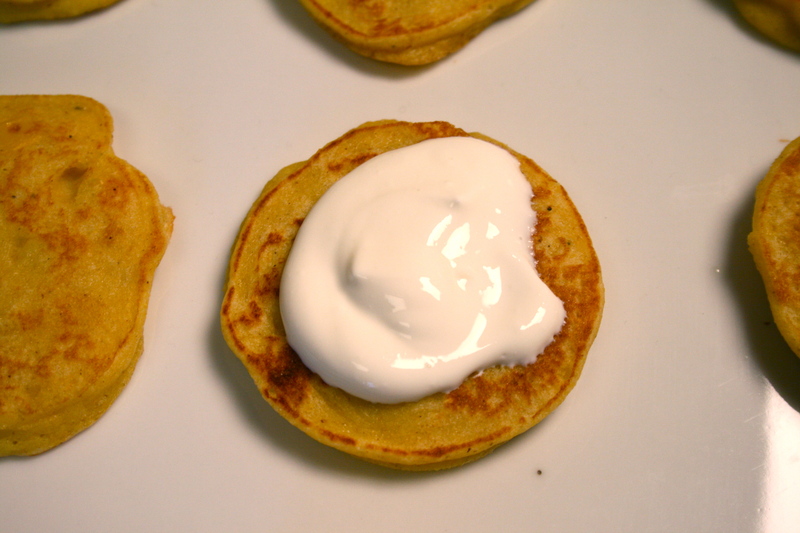 Cheers To The Best Separation Ever: Chilaquiles Divorciados! The Joy of being a Blog Amiga. Long Live Maseca! Wow, these look so good. I need to try them. Great recipe. Excellent! I love Superbowl for the same reason: Food!!! I will try this recipe, looks so good and easy to make. Mmmmm! This recipe looks so delicious. OMG, I am drooling. Must. Try. This. I’m with you! I love going to Superbowl parties for the food, company and (for me) booze lol. So much more fun than football! Yo tengo un hambre! No deberia estar leyendo estas delicias con el hambre que tengo…estoy que me como las fotos LOL! I have to try this. Como dice Helena, casi le pego un mordizco a la pantalla! Great recipe! 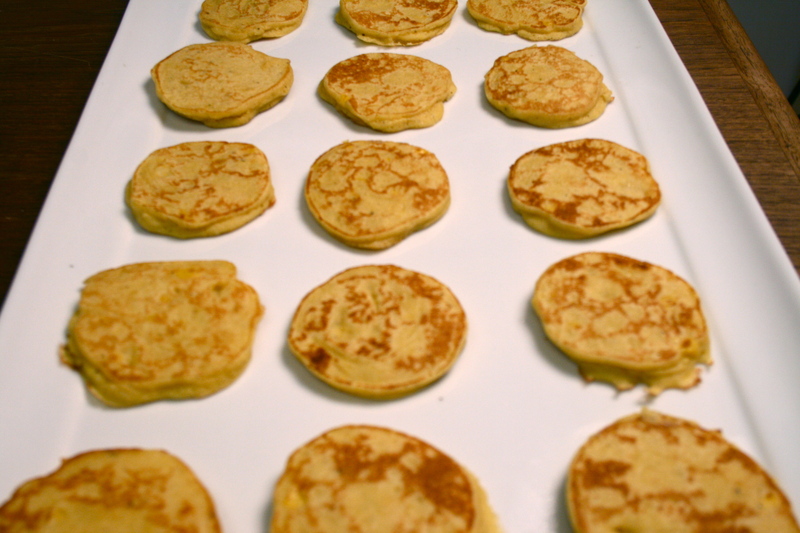 ooh, those remind me of mini arepas with great toppings! que rico! Love, Love, the super bowl for the game and food! My team fell short this year (houston Texans) but we will happilt celebrate the treams that moved on with great food! loving these!! Super Bowl food is the best and this one sounds delish! 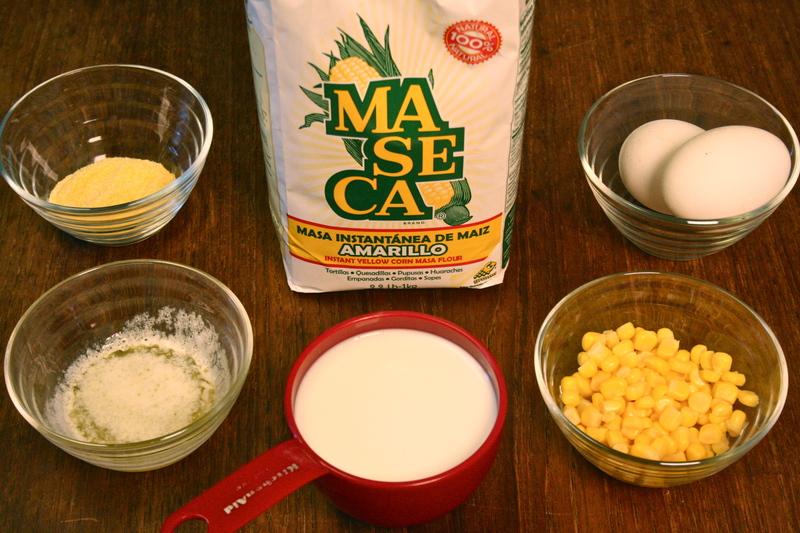 Thank you for yet another great recipe using Maseca…I love it! I can’t believe how easy it looks to make! And my kids love little finger foods! I’m with you, I’m a Superbowl fan, for the same reasons: great parties with lots of delish food. 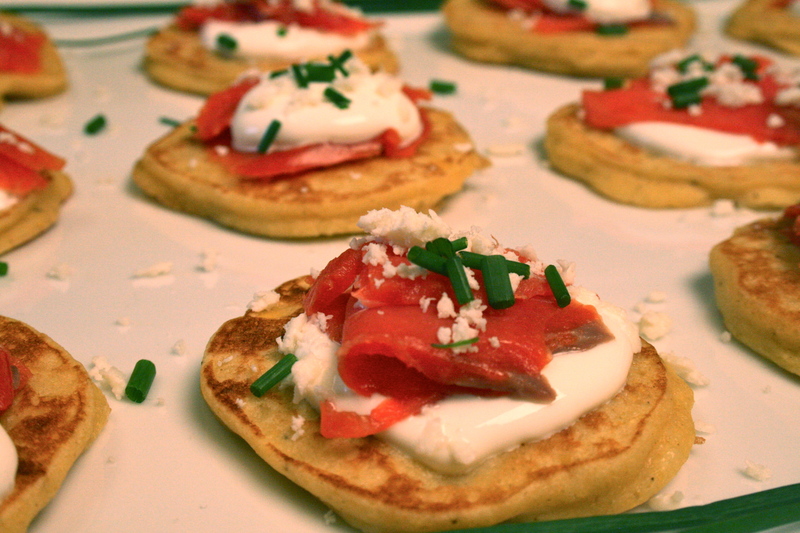 Hadn’t thought about Corn Blinis topped with Smoked Salmon, Sour Cream, Cotija Cheese and Chives and I don’t think most would. My mouth is watering, and its giving chili, pizza, traditional Superbowl food, a run for its money!